Someday, if this site remains after my death, it's style and technology will appear as out of date as this 1954 view by Popular Mechanics magazine (which I recall seeing as a child) of what computers would look like in 2004. I'm very conscious that much in life changes...more. Unlike questions of style and technology, the 'look and feel' of this site, (and our photo, right) the truths of this site - the reality of Jesus Christ, the power of the Gospel to change lives and heal history - will remain undiminished always. It is my prayer that you will choose to look beyond these things that change, to Christ who is powerful to save eternally! 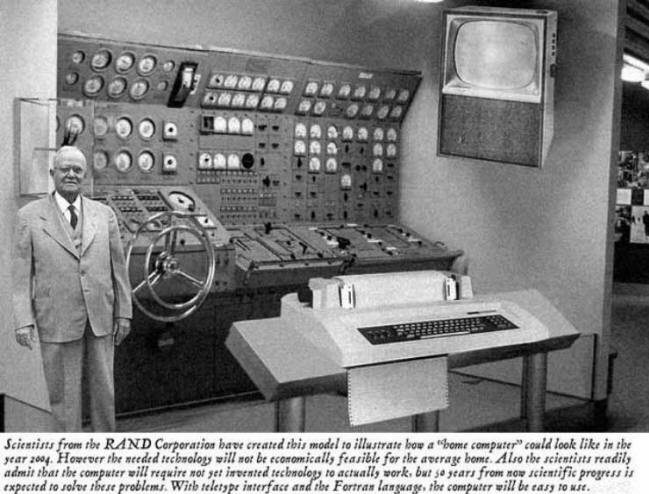 Text in above scan from 1954: "Scientists from the RAND Corporation have created this model to illustrate how a "home computer" could like like the the year 2004. However the needed technology will not be economically feasible for the average home. Also the scientists readily admit that the computer will require not yet invented technology to actually work, but 50 years from now scientific progress is expected to solve those problems. With teletype interface and the Fortran language, the computer will be easy to use."